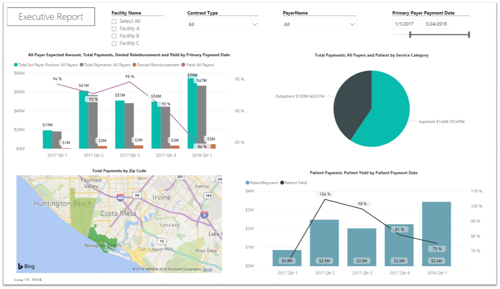 PMMC, a leading provider of hospital revenue cycle management solutions, launched a game-changing revenue cycle analytics platform today at the HFMA Annual Conference that will change the way healthcare financial executives evaluate payer contract performance and drive revenue strategies at their organizations. The new platform aligns with PMMC’s integrated revenue maturity strategy, which enables healthcare providers to succeed at a time when hospital revenue is facing challenges like never before. “With today’s revenue challenges of missed reimbursement, increased bad debt, and the shift to value-based care, healthcare providers need an integrated strategy that connects traditionally disparate parts of the revenue cycle. PMMC Analytics visualizes these trends in a way that executives across the revenue cycle have never seen before,” said Fred Sheffield, Chief Revenue Officer at PMMC. Contract Governance – providers can measure and manage payer performance and better understand denial and underpayment trends. Payer Negotiations – providers can better understand the true value of payer contracts and the ability to visualize the existing contract/baseline to the proposal and how commercial payers stack up against each other. Price Transparency – After assessing proposed charge increases and/or decreases, and truly understanding the impact of the charges using analytics, providers are better positioned to set prices. Value-Based Reimbursement – After establishing contract governance, providers can better understand their competitive advantages and better manage their populations. Click here to request an analytics demo. PMMC is a company that provides high value hospital revenue cycle software and services to improve the financial performance of healthcare organizations. Our software and expertise focuses on payment accuracy and identifying more revenue opportunities across the revenue cycle. PMMC helps hospitals identify underpayments and denials, increase price transparency, and manage bundled payments. Clients see, on average, a 10 to 1 return on investment with software and services.